A Concise History of Itawamba County, Mississippi from the Itawamba County Historical Society. By 1850 Fulton had developed to become the center of commerce in Itawamba County. 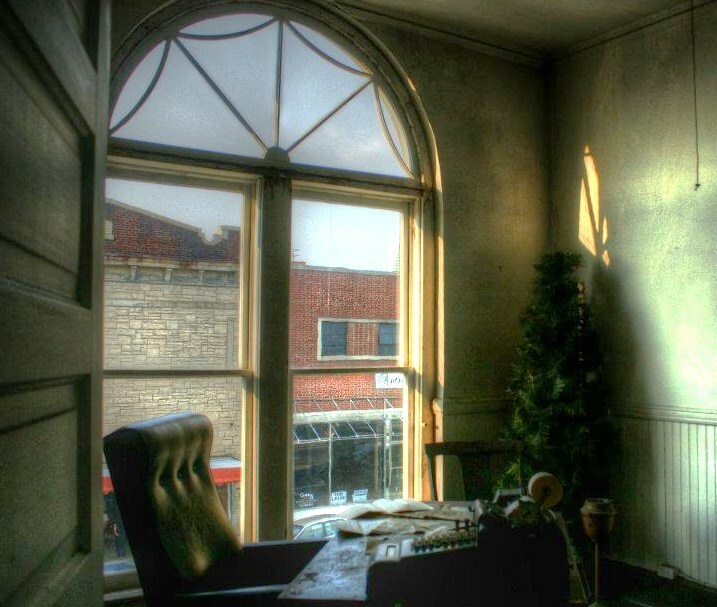 Fulton boasted several businesses during 1850 including: Francis Jones Carriage Maker, Abel Warren Merchantile, B.J. Morris Saddlemaker, Zachariah Phillips Blacksmith Shop, Tannahill Merchantile, Garrett Christopher Grocery, Joseph & Andrew Brown Grocery, James C. Wright Tailor, John G. Kohlheim Merchantile, Joshua Barnard Brick Mason, James Basham Shoemaker, Mayburn Allen Carpentry, Josiah Harrison Merchantile, Thomas Rhea Merchant and Gaither Merchantile, James Duggar Shoemaker, and The Fulton Hearald Newspaper owned by John Massinger. The bustling village also included five attorneys: Arthur B. Bullard, Jeptha Robins, Robert O. Maupin, John W. Downs, and Benjamin Owen. The village was served by four physicians inlcuding John Fletcher Booth, Samuel Vernon, John Moore, and George W. Booth. Fulton boasted two private schools, the Fulton Female Academy run by Louisa Maupin (located at present-day corner of Beene and North Cummings St.) and the Fulton Male Academy (located on the present-day Fulton Cemetery lot). Fulton was served by two inns run by Reubin Wiygul (present-day corner of Wiygul and Clifton streets) and Albert James. The mayor of Fulton during 1850 was William Beachum who served the village's 200 citizens. 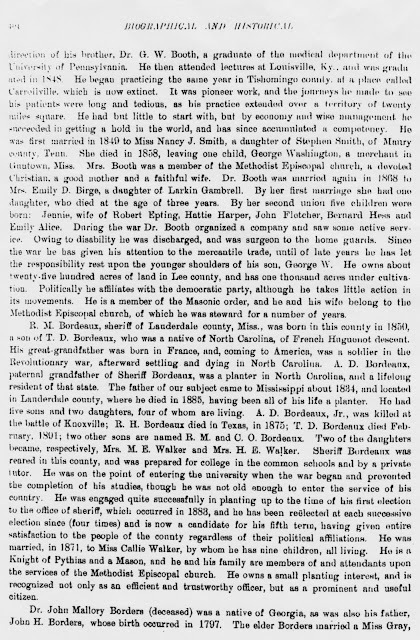 The above excerpt from an Itawamba County Historical Society Journal menitons that Dr. George Washington Booth and his brother, Dr. John Fletcher Booth, had practiced medicine in the young village of Fulton in Itawamba County, Mississippi. 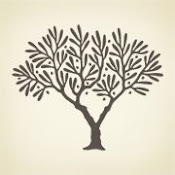 In the 19 page Chancery Suit of Lawrence County, Alabama, Mariah Booth, wife and cousin of Dr. G. W. Booth accuses him of having 'ran off', to avoid being served a summons in the suit. Some of the pages are written in a blurred scrawl with certain words hard to read, however, enough words can be pulled out of it to gather what Mariah was accusing her husband of. "inter???? Ardent Spirits from time to time his cruelty towards your Orator Maria increased and ????? proportion increase his love for liquor til at ????? became sottish.......your Orator with savage cruelty laying violent hands.......and threatening to kill her often and your orator......(several lines smeared)..ought to have children......further upon......humiliation.....Orator Mary Ann with great unkindness.....further states that they have left the home of said defendant, George W Booth......believes that he will be as good as his word for he seems to be restrained l??? P??? ?ly of religion or morality....of that property which she ??? of former husband and father provided per this?? 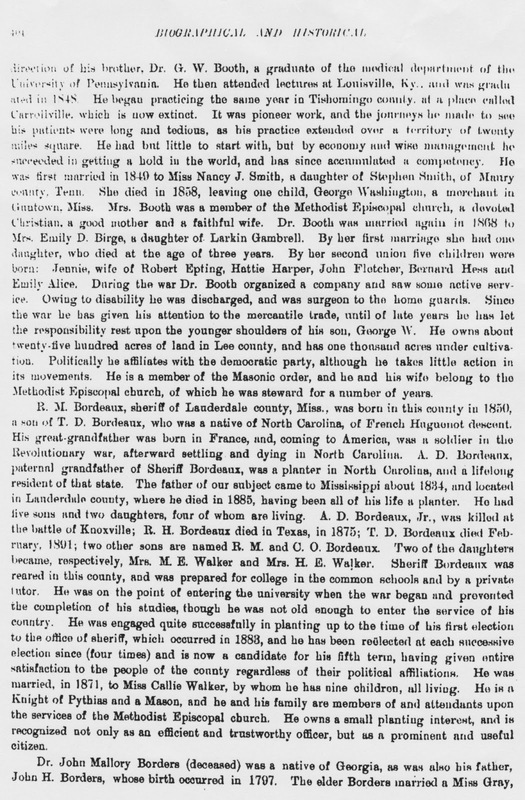 ?....times exhibit...original deed...to South Carolina for...."
After pulling some damaging words from this document, I wanted to see if I could find out more about Dr. George Washington Booth. It was clear where he had "ran off" to...Mississippi. 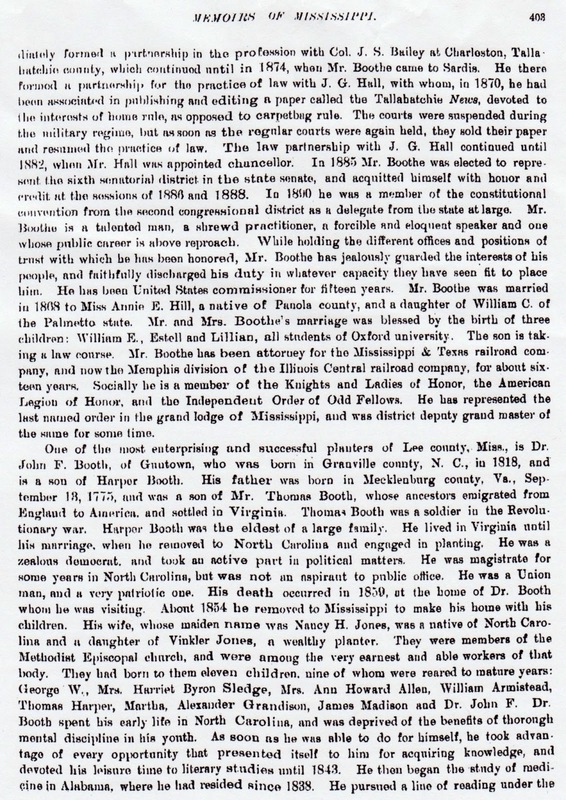 I discovered the below information on his brother Dr. John Fletcher Booth, and the family of Harper Booth in a book with the arduous title "Biographical and Historical Memoirs of Mississippi Volume One: Embracing and Authentic and Comprehensive account of the Chief events in the History of the State and a record of the lives of many of the most Worthy and Illustrious Families and Indivduals". The above pages from the book give a brief account of the Booth family. A fortunate piece of information was the fact that Dr. George Washington Booth was a graduate of the University of Pennsylvania School of Medicine and that he had a strong influence on his younger brother. 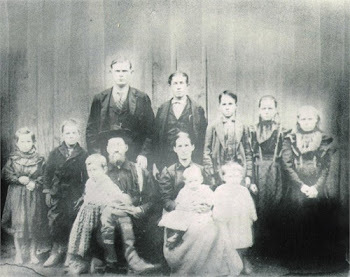 Dr. G. W. Booth was 17 years older than his baby brother Fletcher. He must have taken the young man under his wing. He also must have been a beloved brother, as Fletcher Booth named his oldest son "George Washington", undoubtedly for his uncle. 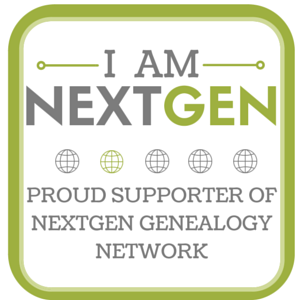 So who was the real Dr. George Washington Booth? 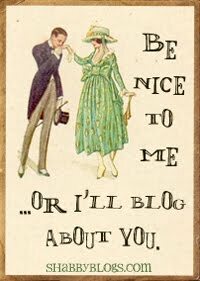 The besotted, abusive, drunken husband of Mariah? 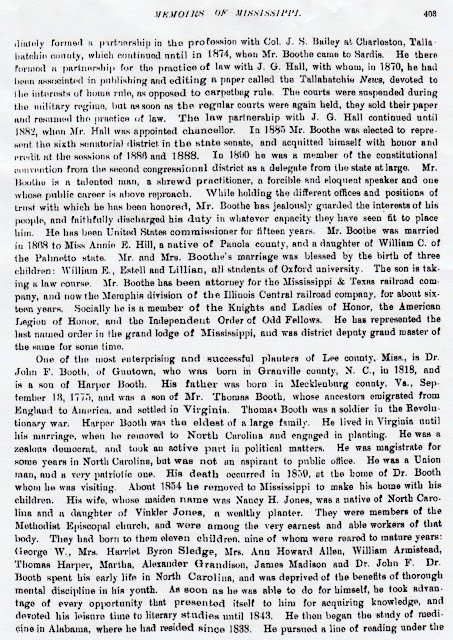 The educated, influential, and beloved brother of Dr. John Fletcher Booth? 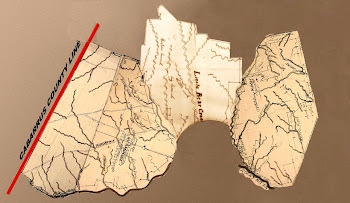 Or the country doctor, who made his way around in the vitual wilderness of mid-nineteenth century Mississippi, helping and aiding the folks of Lee, Itawamba, Tishamungo and Pontotoc counties? Dr. Booth was a man who got around and left some footprints in the dirt. I'm sure I will be able to discover more information on him as the records arrive.